Before the ice hockey match of the Towerstars in Ravensburg, we realized beam shows and graphics with laser mapping, inspired by American sporting events. 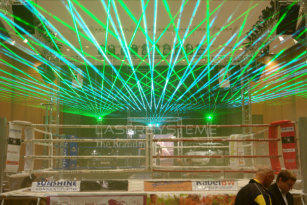 Opening of the K7 Fighting Goeppingen with laser shows and laser graphics. IBU Worldchampionships Biathlon in Nove Mesto, Czech Republic. 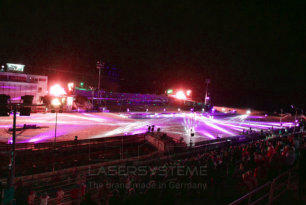 Opening ceremony with laser shows and laser graphics. Opening ceremony of the World Cup in Thai Boxing in St. Petersburg, Russia with Magic Flight artists and laser shows. 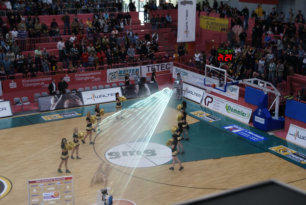 Opening of the 1st GCC Woman Sport Tournament in Kuwait City, Kuwait with laser shows and laser graphics. 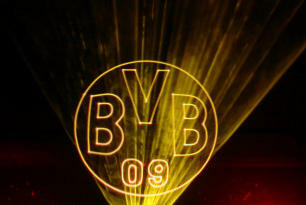 Before starting the football match BVB vs. Hertha BSC, we realized beam shows inside the Dortmund Stadium with BVB logo, projected on the fans of Hertha BSC. Laser tunnel as a gateway for the players of the Walter Tigers Tuebingen; additional with laser projections of the sponsors‘ logos. 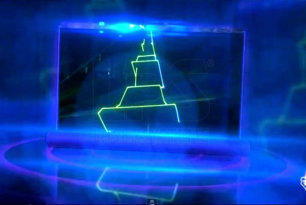 Opening ceremony of the Basket Cup in St. Petersburg, Russia with laser shows. The Baluan Sholak Sports Palace in Almaty, Kazakhstan was pleased with permanent installation of six laser show systemes in time for the Asian Winter Games.